The average American eats about 30 pounds of lettuce each year, reports the Agriculture Council of America, and the most popular type in the United States is iceberg lettuce. What iceberg lettuce lacks in flavor it makes up for in crispness, versatility and storage length -- washed and stored correctly, a head of iceberg lettuce can last up to seven days in the refrigerator. Use the whole leaves as crunchy, low-carbohydrate wraps for grilled meat or vegetables or serve them instead of chips with dip; mix the shredded leaves into salads of cooked, cooled rice, wheat berries or couscous. Hold the head of iceberg lettuce in your hand, core-side up. 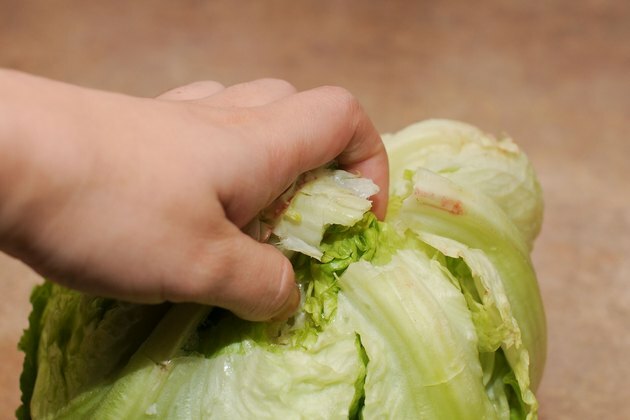 Pound the core of the lettuce firmly down onto a clean, hard surface such as a kitchen counter. Grasp the core, twist, pull it out of the lettuce head and discard. Rinse the entire head of lettuce under cool, running water, holding it cored-side up. Turn the head over and shake it to remove any excess water. Place it on a clean, dry towel or in a colander to drain. 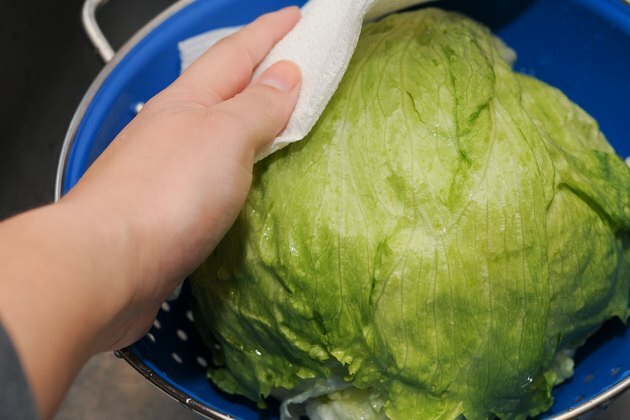 Remove the separate lettuce leaves by hand, if desired, and pat each dry with paper towels or use a salad spinner to free the leaves of as much water as possible. 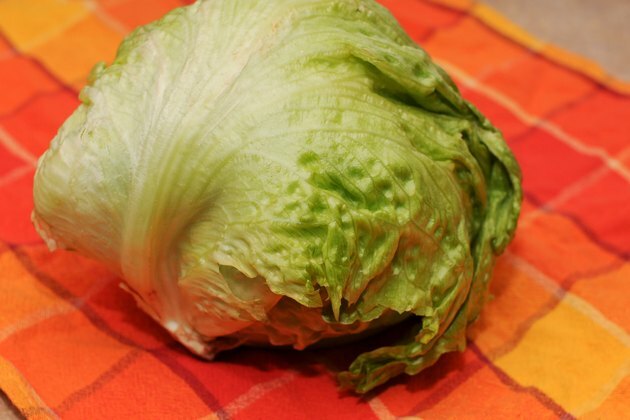 Use paper towels to pat dry the outside of the head of lettuce if you plan on storing it whole. Wrap the iceberg lettuce head or leaves in dry paper towels. 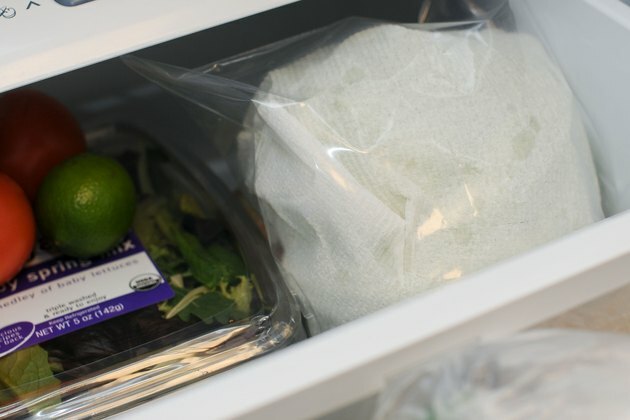 Place in a zip-top plastic bag and store in the refrigerator's vegetable crisper. Do not skip washing fresh iceberg lettuce. Thorough washing can remove potentially harmful microbes, dirt and pesticides. Of all types of lettuce, dietitian Leslie Beck says that iceberg is the least nutritious. Whenever possible, combine iceberg lettuce with other, more nutrient-dense types of lettuce like Romaine or butterhead lettuce. The Globe and Mail: What's the Most Nutritious Lettuce?